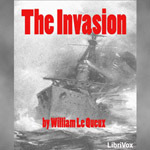 This novel, also known as The Invasion of 1910, is a 1906 novel written mainly by William Le Queux (with H. W. Wilson providing the naval chapters). It is one of the more famous examples of Invasion literature and is an example of pre-World War I Germanophobia, as it preached the need to prepare for war with Germany. The book takes the form of a military history and includes excerpts from the characters’ journals and letters and descriptions of the fictional German campaign itself. The novel originally appeared in serial form in the Daily Mail newspaper from 19 March 1906, and was a huge success. The newspaper’s circulation increased greatly, and it made a small fortune for Le Queux, eventually being translated into twenty-seven languages and selling over one million copies in book form. It is centered on an invasion by the Germans, who have managed to land a sizable invasion force on the East Coast of England. They advance inland, cutting all telegraph lines and despoiling farmland as they go, and the British struggle to mount a proper defense. The Germans eventually reach London and occupy half the city. A junior Member of Parliament declares that “Britain is not defeated” and organizes a resistance movement, the “League of Defenders”, despite harsh reprisals by the Germans and a severe lack of arms. The Germans seem unable to combat this and tighten their control of London, and suddenly find themselves faced with a popular uprising. Eventually a newly-formed British Army marches to liberate London. The fictional war, however, is a stalemate since it appears that German forces have managed to occupy Belgium and the Netherlands.